The reason why I haven't included this in a package or separate price is because I would like to talk with you first to make sure you purchase everything you need in order to make it work correctly. Superior sound with a powerful digital amplifier The Connect Amp's state-of the-art digital amplifier delivers audiophile-quality sound to any room. The energy-efficient Class D amplifier provides 55W per channel of power for excellent audio quality playback — without hisses, crackles or hums. And because the amplifier is built in, you won't need to connect to a stereo to play your music. Just plug it in, connect to speakers and enjoy. 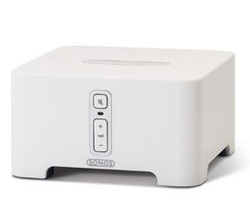 Best-in-class wireless technology for multi-room music Connect Amp brings great sounding music wirelessly to any room in your house, without a big wiring project. SonosNet 2.0, our latest wireless mesh network technology, provides double the wireless range for whole-house coverage, ensures synchronous music playback, and avoids sources of wireless interference. Which means the music gets to all the right rooms — near or far — at exactly the right time. Instant access to endless music Sonos liberates the music on your computer and the Internet so you can play it all, all over the house. Wherever there's a Connect Amp (or any other ZonePlayer), you can listen to your personal library of music stored on your computer, plus thousands of free Internet radio stations. And Sonos works seamlessly with the most popular music services so you can stream millions of songs and stations from the Internet to the rooms of your choice. You can even connect the ZP120 to your favorite audio source such as an iPod or CD player and listen on all the ZonePlayers throughout your house. Simple setup Setting up your Connect Amp is incredibly easy. No technical or wiring expertise required. And no need to break through walls or re-wire your entire house. All you need is a high-speed Internet connection and a router to get started. One ZonePlayer or ZoneBridge in your system must be connected to the router and all the rest will work wirelessly. Add more ZonePlayers in more rooms without adding wires. 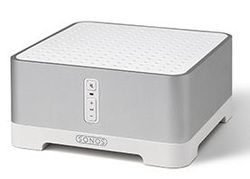 New features and music services with automatic updates Unlike most other consumer electronic products, the Connect Amp and the entire Sonos system keep getting better even after you buy it. With free automatic software updates you'll always have the newest features and music services to enjoy. Just register your system and Sonos will automatically notify you when software updates are available. Simply press one button and your system updates itself. Connects to all your favorite audio equipment Simply connect the Connect to the audio equipment you already own — your home theater receiver, stereo system, powered speakers, and more — and enjoy the music. The digital and analog outputs, connected to your favorite sound system, deliver superior sound to every room. And when it comes to volume control you've got a choice: via Sonos or directly on your favorite audio equipment. Best-in-class wireless technology for multi-room music The Connect brings great sounding music wirelessly to any room in your house, without a big wiring project. SonosNet 2.0, our latest wireless mesh network technology, provides double the wireless range for whole-house coverage, ensures synchronous music playback, and avoids sources of wireless interference. Which means the music gets to all the right rooms — near or far — at exactly the right time. Instant access to endless music Sonos liberates the music on your computer and the Internet so you can play it all, all over the house. Wherever there's a Connect (or any other ZonePlayer), you can listen to your personal collection of music stored on your computer, plus thousands of free Internet radio stations. And Sonos works seamlessly with the most popular music services so you can stream millions of songs and stations from the Internet to the rooms of your choice. You can even connect the ZP90 to your favorite audio source such as an iPod or CD player and listen on all the ZonePlayers throughout your house. Simple setup Setting up your Connect is incredibly easy. No technical or wiring expertise required. And no need to break through walls or re-wire your entire house. All you need is a high-speed Internet connection and a router to get started. One ZonePlayer or ZoneBridge in your system must be connected to the router and all the rest will work wirelessly. Add more ZonePlayers in more rooms without adding wires. New features and music services with automatic updates Unlike most other consumer electronic products, the ZP90 and the entire Sonos system keep getting better even after you buy it. With free automatic software updates you'll always have the newest features and music services to enjoy. Just register your system and Sonos will automatically notify you when software updates are available. Simply press one button and your system updates itself. Crystal-clear, room-filling sound The S5 is a high-performance wireless music system with 2 tweeters, 2 mid-range drivers and 1 subwoofer driver for bass you can feel. Each speaker is powered by a dedicated digital amplifier (5 in all) and optimized to deliver accurate tonal balance and deep bass. The S5’s all digital sound architecture provides precise sound reproduction, just as the artist intended. And all filter settings, active equalization and time-alignment are done in the digital domain through state-of-the-art DSP circuitry, so there’s absolutely no loss of audio quality or energy. Convenient, all-in-one solution The S5 is a complete wireless music system that works wherever you want music. No need to connect to speakers or audio equipment. Just plug it in and enjoy. Want music in another room? Simply add more S5s to your house without adding wires. And when the party moves outside or to another room, just pick up the S5 with the convenient, built-in handle and take the music with you. Instant access to endless music Sonos liberates the music on your computer and the Internet so you can play it all over the house. Wherever there’s an S5 (or any other ZonePlayer), you can listen to your entire collection of iTunes music, plus thousands of free Internet radio stations. And Sonos works seamlessly with the most popular music services so you can stream millions of songs and stations from the Internet to the rooms of your choice. You can even connect the S5 to your favorite audio source such as an iPod or CD player and listen on all the ZonePlayers throughout your house. Control it all from your iPhone and more Wirelessly control all your music and all your ZonePlayers with your choice of Sonos Controllers. Got an iPhone™ or iPod© touch? Then, simply download the free Sonos Controller for iPhone app and take control. Want a dedicated Controller that everyone in the house can use? Grab the touch screen Sonos Controller 200 and pick a room, find a song and touch play. Got a desktop or laptop? Then use the Sonos Controller for Mac or PC for added control. They all work together seamlessly so mix and match to your heart’s content. Best-in-class wireless technology for multi-room music The S5 brings great sounding music wirelessly to any room in your house, without a big wiring project. SonosNet 2.0, our wireless mesh network technology, provides superior wireless range for whole-house coverage, ensures synchronous music playback, and avoids sources of wireless interference. Which means the music gets to all the right rooms — near or far — at exactly the right time. Simple setup & expansion Setting up your S5 is incredibly easy — simply plug it in. No technical or wiring expertise required. No speakers or audio equipment to connect. All you need is a high-speed Internet connection and a router to get started. One ZonePlayer or ZoneBridge in your system must be connected to the router and all the rest will work wirelessly. Add more S5s in more rooms without wires. New features and music services with automatic updates Unlike most other consumer electronic products, the S5 and the entire Sonos system keep getting better even after you buy it. With free automatic software updates you’ll always have the newest features and music services to enjoy. Just register your system and Sonos will automatically notify you when software updates are available. Simply press one button and your system updates itself.